My Student Wei Long (Byron Jacobs) has made an multi-language website for me, in order to enable many people to be able to know more about me, my Xingyi Quan and my Bagua Zhang. Through this more people may have the opportunity to contact me, learn from and study with me. Through the medium of the internet, people can quickly access information and learn more easily in todays world. We should use this medium to our full advantage to help spread and popularize traditional Chinese Wushu. 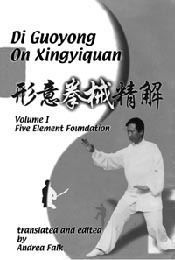 Through this website, apart from it being a medium to contact me, I want to use it to share my feelings and knowledge gained by my many decades of experience in training Xingyiquan and Baguazhang. I want to share my decades of technical experience and deep knowledge with all those who love Chinese Wushu and with those who want to research the arts deeper, so this knowledge can carry forward into the future. I want these people to become true members of Wushu’s big family. This website will also help me to make a lot of new foreign friends, and to communicate and discuss with you all about Chinese Wushu, and to share our experiences and have healthy debates from different viewpoints. Together we can investigate Xingyiquan and Baguazhang theory deeper. While I have many decades of experience, and have my own feelings about this, I always welcome others to share their feelings and thoughts on these arts. This is the best way for better understanding and personal development. I welcome all those who love Wushu to share your own views, to freely discuss your views, and to learn from each other. Through this debate we will raise traditional Wushu to new levels. Through Wushu we can strengthen our bodies, our minds and our morality. I welcome all of you to view and enjoy the website, to contact me for training or to discuss and debate with me, and most of all to build good relationships within the martial community. Spreading and sharing Wushu.